It is moving to learn about people who need to force their way to the light, to break out of an old mold and bravely build themselves a new philosophical cornerstone. Not everyone is born an atheist, or gets to grow up with parents or siblings who are not believers and who regard religion as something that is best kept for spare time as a hobby (at best), for those who are born into this world with parents and a whole community of believers it is unbelievably difficult to break the mold and step forward. It take a lot of courage, but even more than that it takes an honest person to reveal him or herself as a non-believer to a community that has never accepted anything but believers – who are formed in their own shape. The honesty is a vital component here because it seems easy enough to not say anything to anyone and only to be a non-believer at heart, the story of Jerry DeWitt is not one of “closet” atheist but of a person who found out he does not believe any longer and when confronted with the every day stuff religious people deal with his honesty took over. This article about Jerry DeWitt (NY Times) is well worth a read, to remind many of us that there are still plenty of people in this world who face extraordinary difficulties in expressing their own belief in public and who need to pay a dear price for it, and also remind us that our conscience and beliefs change – and that we should accept changes in others as we wish to have them accept those changes in us (almost sounds religious – does it not?). And what is it exactly that is moving in this story? the fact that a pastor drops out of his faith or the fact that this step is met with so much resistance and anger, fear and hostility?, we should hope that in the very near future people who live in Western countries (such as the U.S.) could make steps that correlate with their moral compass without fear of becoming a community outcast, or getting fired from work, or losing all your friends. 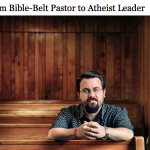 Religion has formed itself on cases like these, it has been doing that for hundreds and thousands of years, it is no mistake that a former pastor turned atheist gets to do this walk of shame, because religions have gotten used to systematically bully free thinkers out of stepping forward, and at the same time to fiercely preach for being true and honest. The community in this case follows the old golden rules, “it its not like you – treat it badly”. That is the only way religion knows how to survive, and this will change only when the balance of power will turn and religions will be outnumbered by non believers. 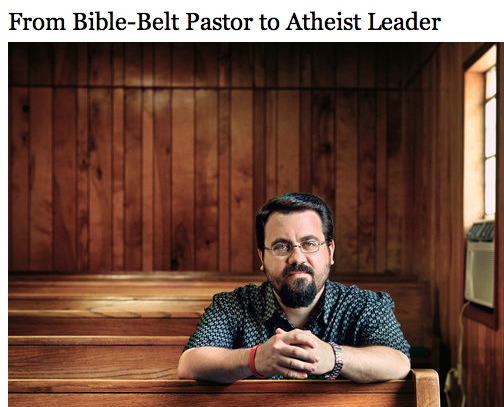 Still, this pastor is somewhat lucky, for if he was living under Islam he would have lost much more.